This is one of my Coleus from last year (2005). This was a tall Coleus that tried to bloom as much as it could. I took cuttings of this to overwinter and it survived at work, but the main stem recently started to die and all I was left with were the small tips. I cut the remaining tips off and those are now in ICU at home under growlights. They look like they may make it. I just noticed that this photo was taken last year on Thanksgiving. It’s colors are very autumn-esque. 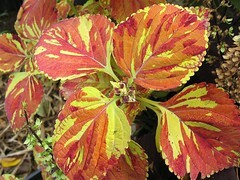 This entry was posted in Uncategorized and tagged coleus, coleus copper splash. Bookmark the permalink.